I've struggled over whether to share this one or not. Eventually, though, I came to the conclusion that when we share our projects via our blog posts, we are also sharing a little something of ourselves and our lives. And life isn't always flowers and sunshine, unfortunately. Today (as I write this), I received the news that someone very dear to me has taken her last breath. This card is for her family. For me, this picture represents a precious cargo being guided into a safe haven at the end of its journey. 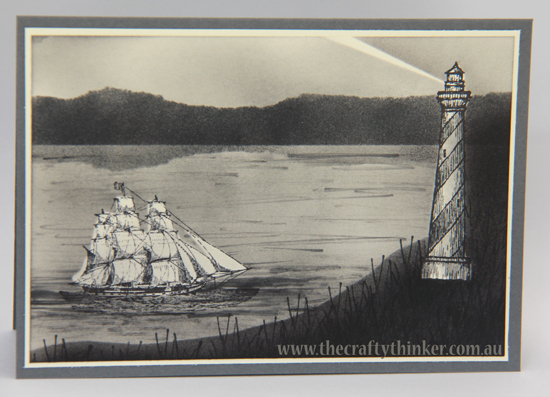 I stamped the lighthouse & ship with black into onto Very Vanilla cardstock & masked them. I tore a piece of scrap paper to produce something like a cliff edge and used it as a mask while I sponged with black ink. I used Mememto Tuxedo Black as I think it's a bit of a softer, warmer black. I tore another piece of scrap paper to create a mask for the mountains and used a straight edge of paper to mask the sea while I sponged the mountains with black ink. I then, very lightly, sponged black onto the sky area, using the straight edge of a scrap of paper as a mask to create the beam of light from the lighthouse. I reversed my "mountain" mask and sponged the mountain reflection into the sea area. Then I lightly sponged all of the sea area. The ship stamp has built in waves which I needed to incorporate into my scene somehow. So I used a small brush and watercoloured in swirls of black ink until it seemed blended enough. I removed the masks from the lighthouse & ship and gave them a very light touch of black ink to reduce the stark contrast a little. I used the grass stamp from In the meadow to stamp with black in the foreground.